The Sabbath was hallowed at the Creation. It was ordained for man. It had its origin when the morning stars sang together, and all the sons of God shouted for joy. Job 38:7. The earth was in harmony with heaven. God saw everything that He had made, and, behold, it was very good. Genesis 1:31. And He rested in the joy of His completed work. Furthermore, God blessed the seventh day, and sanctified it. Genesis 2:3. In other words set it apart to a holy use. He gave it to Adam as a day of rest. The seventh-day Sabbath was a memorial of the work of creation, and thus a sign of God’s power and His love. The Scripture says: He hath made His wonderful works to be remembered. Psalm 111:4. The things that are made, declare the invisible things of Him since the creation of the world, even his eternal power and Godhead. Romans 1:20. What did God do in the beginning? By what means was this accomplished? By the word of the Lord were the heavens made; and all the host of them by the breath of his mouth. For he spake, and it was done; he commanded, and it stood fast. Are we to understand from these words that the matter of the earth was not in existence before he spake? Who was the active agent in creation? God, who at sundry times and in divers manners spake in time past unto the fathers by the prophets, Hath in these last days spoken unto us by his Son, whom he hath appointed heir of all things, by whom also he made the worlds. Is there anything that the Son did not make? Since it was by the Son that the Father created all things, what is his rightful title? In the beginning was the Word, and the Word was with God, and the Word was God. All things were made by him; and without him was not any thing made that was made. How has the Father addressed the Son? But unto the Son he saith, Thy throne, O God, is for ever and ever: a sceptre of righteousness is the sceptre of thy kingdom. And, Thou, Lord, in the beginning hast laid the foundation of the earth; and the heavens are the works of thine hands. Then how should he be regarded by all creatures? In what condition was the earth when it was first spoken into existence? After the creation of the substance of the earth, what was the first thing done? What did God call the light and the darkness? What do a period of darkness and a period of light together constitute? Which always comes first in the formation of a day? What was done on the second day? How is this day’s work referred to by Job? What was done on the third day? What was made upon the fourth day? What were these lights to govern? What were these days of creation? Does the sun make the day, or simply rule the day? If the sun were to become a body of darkness, the day would still be the same length that it is now. What makes the day and how there could be days before the sun was? What was made on the fifth day? And God said, Let the waters bring forth abundantly the moving creature that hath life, and fowl that may fly above the earth in the open firmament of heaven…. God created great whales, and every living creature that moveth, which the waters brought forth abundantly, after their kind, and every winged fowl after his kind: and God saw that it was good. … the evening and the morning were the fifth day. What upon the sixth day? And God made the beast of the earth after his kind, and cattle after their kind, and every thing that creepeth upon the earth after his kind: and God saw that it was good. And God said, Let us make man in our image, after our likeness: and let them have dominion over the fish of the sea, and over the fowl of the air, and over the cattle, and over all the earth, and over every creeping thing that creepeth upon the earth. So God created man in his own image, in the image of God created he him; male and female created he them. How did God regard his work when it was done? How did he spend the seventh day? After he had rested on the seventh day, what did he do? What is the meaning of sanctify? To set apart for a holy use. What is the name of the seventh day? But the seventh day is the sabbath of the Lord thy God: in it thou shalt not do any work, thou, nor thy son, nor thy daughter, thy manservant, nor thy maidservant, nor thy cattle, nor thy stranger that is within thy gates. For whom was the Sabbath made? What is implied in the statement that after God had rested upon the seventh day he sanctified or set it apart? He told man what He had done and commanded him to keep it holy. Give some instances of the use of the word sanctify which confirm this. And the Lord said unto Moses, Go unto the people, and sanctify them to day and to morrow, and let them wash their clothes. What is the great object of the Sabbath? How does the Sabbath serve as a sign to make us know the true God? Six days may work be done; but in the seventh is the sabbath of rest, holy to the Lord: whosoever doeth any work in the sabbath day, he shall surely be put to death. Wherefore the children of Israel shall keep the sabbath, to observe the sabbath throughout their generations, for a perpetual covenant. It is a sign between me and the children of Israel for ever: for in six days the Lord made heaven and earth, and on the seventh day he rested, and was refreshed. What is God’s distinguishing characteristic? For the Lord is great, and greatly to be praised: he is to be feared above all gods. For all the gods of the nations are idols: but the Lord made the heavens. But the Lord is the true God, he is the living God, and an everlasting king: …The gods that have not made the heavens and the earth, even they shall perish from the earth, and from under these heavens. He hath made the earth by his power, he hath established the world by his wisdom, and hath stretched out the heavens by his discretion. What is the difference between God and men? [a] Answer: Psalm 100:3 ; Isaiah 40:17, 18; Isaiah 55:9. All nations before him are as nothing; and they are counted to him less than nothing, and vanity. To whom then will ye liken God? or what likeness will ye compare unto him? Then what was the Sabbath designed to do for men? To be a continual reminder of God’s greatness, and of their dependence upon him, and of their duty to serve him with humility. If Christ created the heavens and the earth, who must have made the Sabbath? He is the Creator of the seventh-day Sabbath. Then what relation does He sustain to it? Then in keeping the Sabbath, whom do we honor? Both the Father and the Son. And when the Sabbath is not kept, who is dishonored? Both the Father and the Son are dishonored. When the earth was created, “darkness was upon the face of the deep.” The phrase “in the beginning,” marks the beginning of the first day of time. Consequently the first day of time began in darkness. Before the earth had completed its first revolution, God said, “Let there be light, and there was light.” God saw that the light was good, “and God divided the light from the darkness. And God called the light day, and the darkness he called night. And the evening [the darkness] and the morning [the light] were the first day. “The first revolution of the earth was completed just at the dividing line between light and darkness; and as the first part of that day was in the darkness which up to that time had been unbroken, so the second day began with the darkness which had then been set off and placed within bounds. And because time began in darkness, the first portion of every day of time has been darkness. Men may adopt as many standards as they please, but every day of time has begun with evening, and so it will be as long as time lasts. The same one who in six days created the heavens and the earth, also “rested the seventh day,” and blessed and sanctified it “because that in it he had rested.” We have already learned of Christ that “all things were created by him and for him; ” therefore he must have made the Sabbath. Therefore He ” is Lord even of the Sabbath day.” This does not exclude the Father from the creation and the making of the Sabbath, for the two are one. God made the worlds by his Son. Both were united in the creation, as they are in everything. And so men “should honor the Son even as they honor the Father.” When the Sabbath is not kept, both the Father and the Son are dishonored. The command concerning the observance of the Seventh-Day Sabbath is still binding upon all the inhabitants of this earth. God has set apart this day as a sign between Him and His people. Furthermore, as a sign of their loyalty. The Law of God is immutable. It is as enduring as eternity. Therefore, we proclaim His law as changeless in its character. Those who obey this law will bear the seal of the living God. There is no sanctification in the first day of the week. 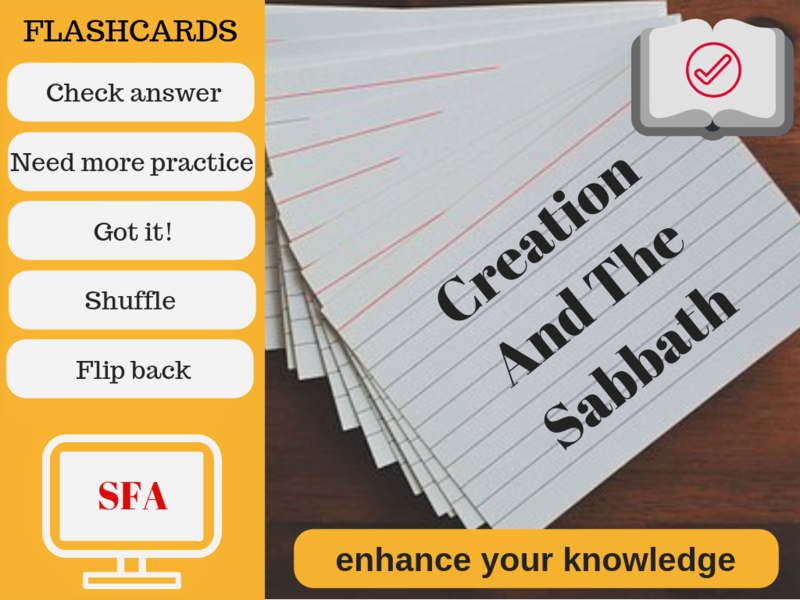 On the other hand, the Seventh-Day Sabbath was set a part as a memorial of the work of creation. Every one is to look to God, the Creator of the heavens and the earth, for light and guidance. Him alone are they to honor and worship. Heed the warning against the worship of the beast and his image.